Southern Deviled Eggs - Easy and Delicious! 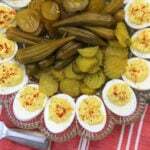 Home » Recipes » Appetizers » Southern Deviled Eggs – Easy and Delicious! Southern Deviled Eggs – Easy and Delicious! 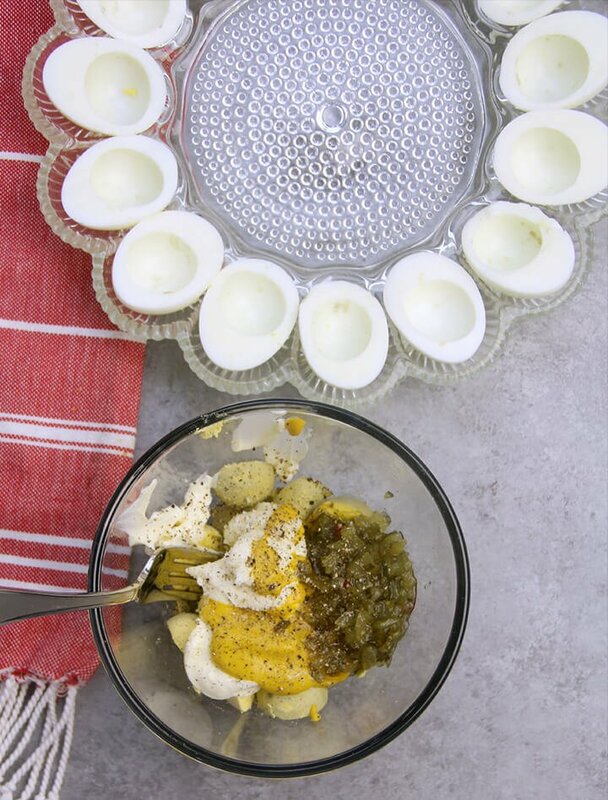 Southern Deviled Eggs are creamy with a touch of sweetness from pickle relish and a sprinkle of paprika on top. Very simple and tasty! 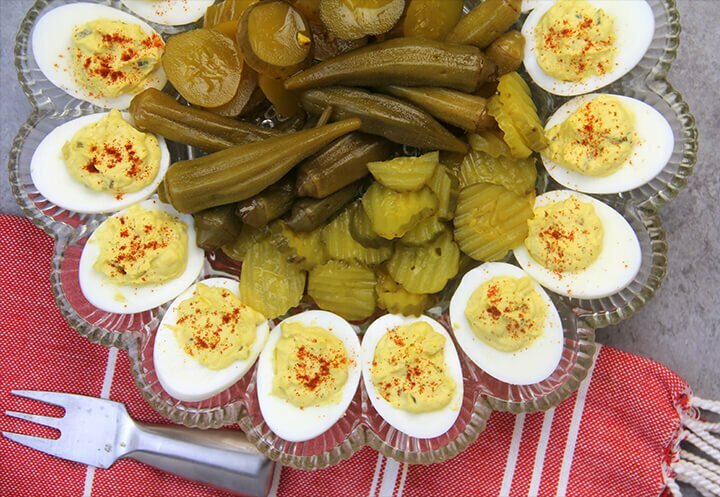 A Southern gathering isn’t complete without a plate of deviled eggs…and that plate is always a deviled egg plate. Every good Southern hostess should have one, usually passed down from her Mama. Deviled eggs are a nice accompaniment to any roasted meat, such as turkey or pot roast, and especially good with fried chicken! Southern deviled eggs are a quick and tasty way to use up Easter eggs or just to take something to a party. And these days, they have become quite a fancy addition to restaurant menus, with all kinds of variations and flavors. Have y’all had fried deviled eggs? We had some at a restaurant in Pigeon Forge and they were delicious! Have you ever wondered where the name Deviled Eggs came from? According to History.com, a form of deviled eggs was served in ancient Rome. The recipe and technique changed over the years, with the first known printed mention of food as “deviled” in Great Britain in the 1700s. The term referred to food that was spicy or highly seasoned. And mayonnaise didn’t even become part of a traditional Southern deviled egg recipe until around 1940! 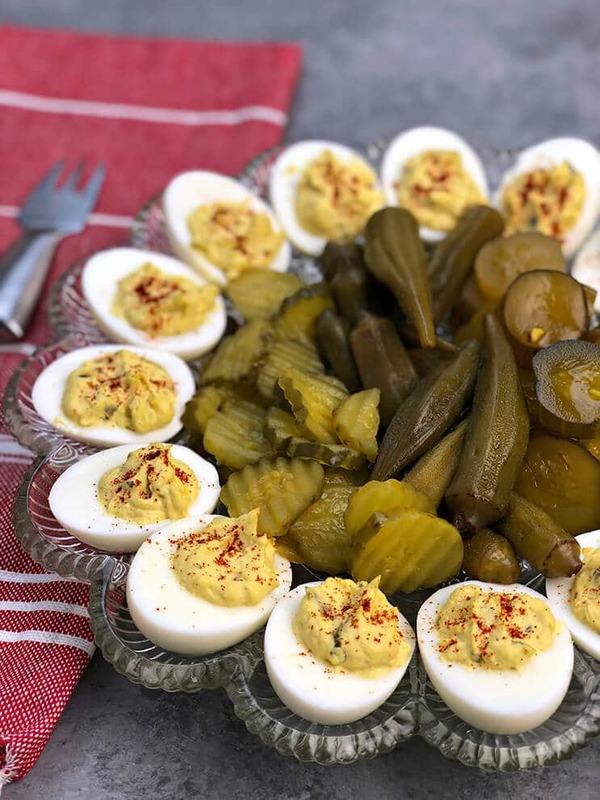 You’ll find lots of variations of deviled egg recipes and even Southern Deviled Egg recipes can vary from person to person. Nobody’s Grandma followed a recipe so everyone has their own little tweaks, but the basic ingredients are usually the same. You do not want soft-boiled eggs for these Deviled Eggs because they would be too runny. I place my eggs in the pot, cover with cold water, and then bring the water to a boil and boil for about 1 minute. Then turn off the heat, cover, and let them sit for 10 minutes. This produces perfect hard-boiled eggs, which is what you want for Southern Deviled Eggs. Let’s talk about that deviled egg platter. Mine was given to me by my Mama when I first got married and I’m pretty sure it came from her Mama or Grandma. A deviled egg platter used to be a rite of passage or a traditional wedding gift. If you don’t have one already, I suggest this clear glass one or this one for easy transporting of the deviled eggs. They are inexpensive and give just the right nostalgic touch to your table. How Do You Make Deviled Eggs? Easy Step-by-Step Instructions! I usually start with a dozen eggs. After your eggs have rested in the hot water for about 10 minutes, rinse them well under cold water and then peel. 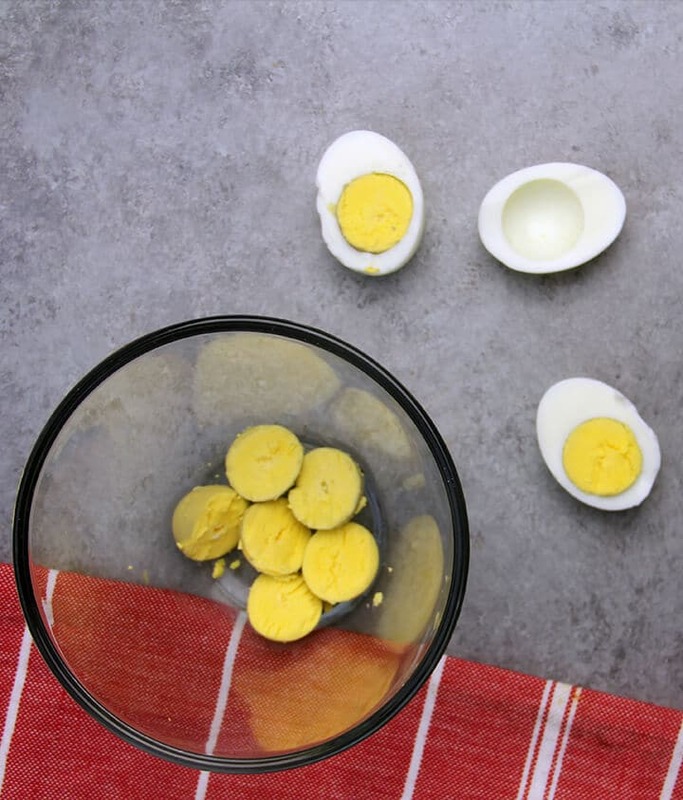 Once peeled, slice eggs in half and pop out the yolk. Add the mayonnaise, mustard, pickle relish, and salt and pepper and just mash it all together until the consistency is however you like it. **Pro Tip: Some folks like their deviled eggs more creamy, so if that’s you then add a little more mayonnaise. I like mine slightly less creamy and with a little more mustard to give some tanginess. Use a spoon or fork to scoop the mixture back into the egg whites, or you can even use a pastry bag or a plastic bag with the corner cut off. **Pro Tip: Use two spoons, one for scooping and one for scraping the mix into the egg white. You can leave the deviled eggs plain or lightly sprinkle with paprika. Keep the deviled eggs in the refrigerator. You can make these eggs up to two days in advance. Do not freeze deviled eggs. 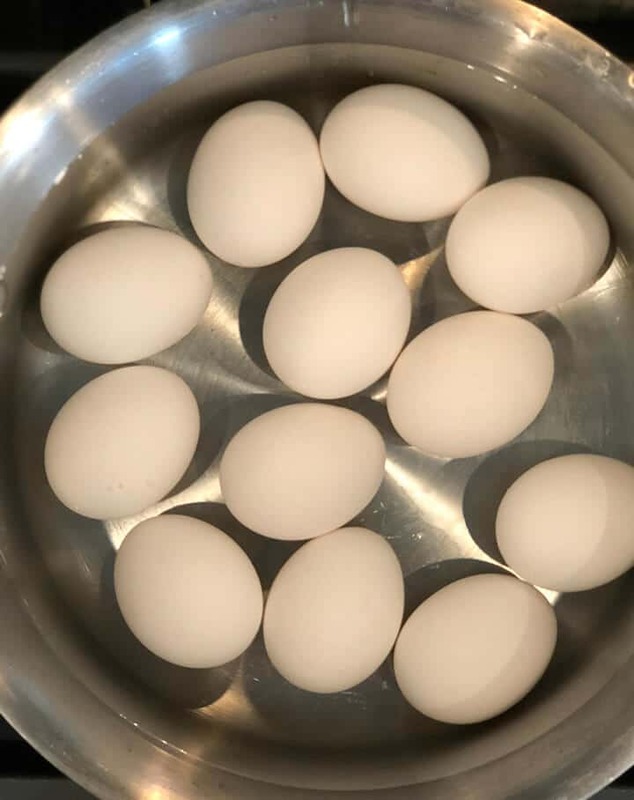 Place eggs in a large pot and cover with cold water. Bring water to a boil, then cover pot and remove from heat. Let eggs sit for 10-15 minutes then rinse under cold water and peel. Slice in half and remove yolks. To yolks, add mayonnaise, mustard, relish, salt and pepper. Mash together with a fork. Spoon mixture into egg white halves or use a pastry bag. Sprinkle lightly with paprika. Add more or less mayonnaise to get the consistency you want. Use two spoons, one for scooping and one for scraping into the egg white. Make up to two days in advance. 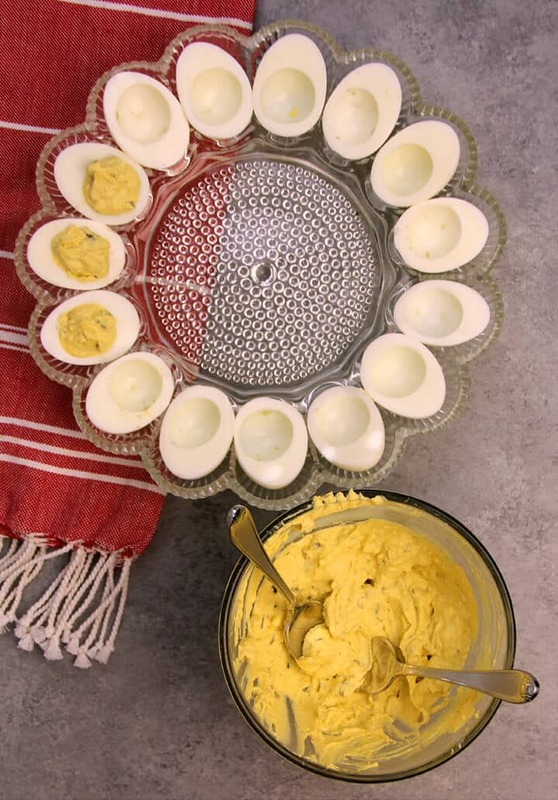 Update Notes: This Southern Deviled Eggs post was originally published April 1, 2013, and on November 20, 2018, was updated with one or more of the following: step-by-step photos, video, updated recipe, new tips. It’s all about the relish! Yum! So good! I like to add a little white sugar to my ingredients. I made deviled eggs the same way! and they are awesome, everyone loves them! one day I was making deviled eggs, with mayo, mustard, salt, pepper and paprika for the top, as I was mixing the yolk mixture I wanted to try sweet relish, so I add relish to the mixture, and bingo! I loved them! now I don’t make deviled eggs with out relish, it give it that extra taste to it!